for an updated map of the Gulf Oil Spill relief efforts. For a period of several months, 50,000 to 60,000 barrels of oil per day flowed from the site of the Deepwater Horizon well straight into the Gulf of Mexico. After the initial explosion on April 20th, the first reports of oil sightings on the coastlines began on June 1st. People living and working along the shoreline spanning Louisiana, Mississippi, Alabama and Florida saw clumps of crude oil on their local beaches. That was followed by reports of birds, dolphins, fish and sea turtles covered in slick black oil. In the aftermath of the largest environmental disaster in U.S. history, environmental groups across the country have been rallying in support of both immediate coastal reparation and long-term solutions for the damage the Gulf Oil Spill has wreaked on the ecosystem. With those goals in mind, Washington, D.C.-based Defenders of Wildlife, an organization dedicated to protecting species and the habitats on which they depend, is doing everything it can to raise awareness and action for greater cleanup and conservation. The organization is working to educate policymakers about the importance of protecting wildlife and securing a moratorium on further offshore drilling. In addition, Defenders of Wildlife has been issuing ongoing reports on the number of birds, sea turtles and marine mammals found covered in oil along the coast. As many as 400 different species of animals are projected to be impacted by the environmental nightmare. Since massive cleanup activities are being led by a number of environmental groups, Defenders of Wildlife also decided to use their powerful mapping platform called the Conservation Registry to track the collective efforts of all the various groups into one comprehensive map. 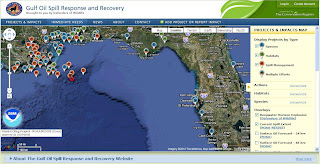 This Gulf Oil Spill Recovery map was created using the Google Maps API and the Google Earth API. It allows any users, whether they’re part of a non-profit group or concerned citizens who want to report what they observe in their backyards, to upload stories, photos and video to the common shared map. The result is an impressive illustration of all the projects - from beach cleanups to air monitoring surveys to sediment sampling - going on in the region to help rescue and restore affected species and their habitats. The map also shows numerous steps that the Obama Administration is taking to mitigate the near- and long-term impacts of the spill. As the map evolves, you’ll be able to see how the marine environment and coastlines recuperate from collaborative efforts by average people, non-profit organizations and government agencies. Through this video, our most recent Google Earth Hero, Defenders of Wildlife, shares more about the creation of the Gulf Oil Spill Recovery application. Their hope is that it will not only help people visually understand the scope of the spill and recovery work, but also spur volunteers into taking action and getting involved themselves. Additional data contributed by Defenders of Wildlife, news and user videos can also be found on the Google Crisis Response oil spill recovery site. 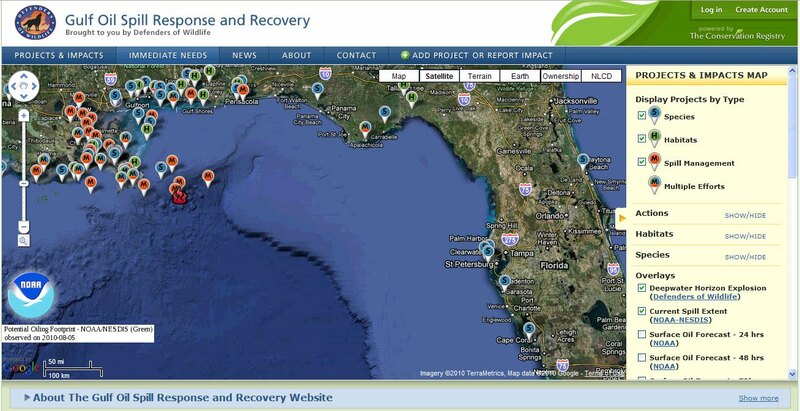 Update: please visit the Conservation Registry for an updated map of the Gulf Oil Spill relief efforts.